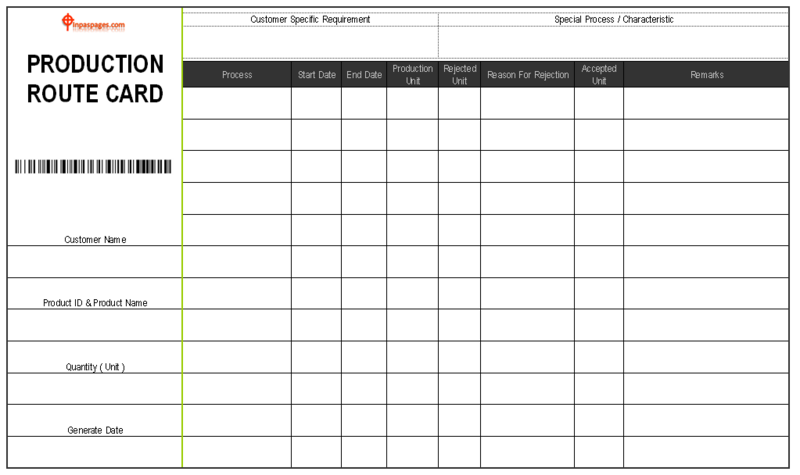 Production route card or production job slip / Job card is used for planning the material flow for the production with step by step process and sequence required for the product, this planning sheet is used in all the manufacturing industry that basic requirement for the process sequence and interaction between all the processes and product requirements. Product ion route card is information sheet for the order wise / customer wise product progress and route can be track and improvement can possible to monitor. Quantity are manufacturing as per customer requested in purchase but here purchase order number are not mentioned due to mostly regular customers with same materials with different schedule can possible hence the material route and tracking are same, hence the required or possible quantity are taken in process. Generate date – this production route card generated date. customer specific requirement – when the customer are place the order, generally all the technical details are attached along with purchase order, but mostly requirements are generic which is already in process are used as per previous experience, but the some customer specific requirement which is specially required with product sizes or something specific that need to mentioned in production route card. Special process / Characteristic – is the special process requirement that customer had requested to compliance of its application product or some special requirements, this process is extra process which is some special treatment or special characteristic base application product requirement can fulfill, hence this is very important for the production route card.